It is nearly Halloween! The trick for this treat is to include as many icons of the holiday as possible. Haunted house, ghosts, pumpkins, gravestones and even a harvest moon! 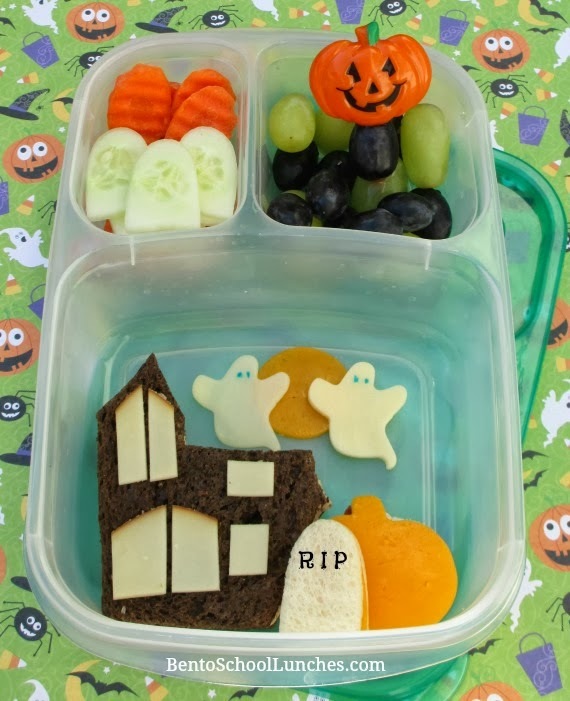 Haunted house pumpernickel sandwich with smoked Gouda cheese windows, pumpkin sandwich with mild cheddar cheese, gravestone sandwich of white wheat, mild cheddar moon and provolone cheese ghosts with food safe marker eyes. Crinkle cut carrots and cucumber cut into headstones shapes. Black and green seedless grapes with Jack-o' lantern cupcake pick. This lunch is packed in our Easylunchboxes container. such a cute lunch Rina!! Love the haunted house and floating ghosts!